14 Forest Drive:3 bedroom home with its own screened in pool and access to Greenwood Forest Amenities! 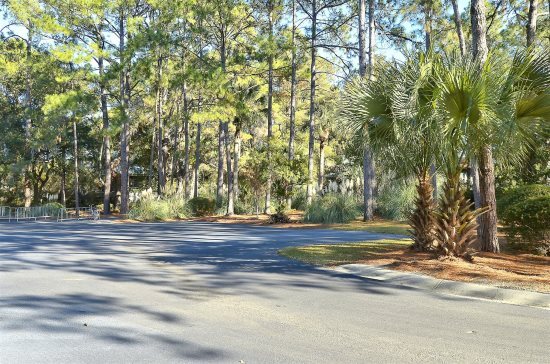 Sea Pines Plantation is one of the most popular areas of Hilton Head Island. With plenty of entertainment for your family and miles and miles of bike trails, this neighborhood has everything to offer, including trolley rides to the beach! Located in the heart of the plantation, this lovely home is perfect! Located on a quiet cul-de-sac, 14 Forest Drive is a bright, modern home that will help you and your family create precious vacation memories for generations to come! Approximately six steps lead to the beautifully etched front door and tiled foyer; step inside and you will instantly know that you chose the perfect property! A wall of floor to ceiling windows frame the screened in pool and invite you to take a refreshing swim! There are Adirondack chairs for relaxing, reading a book, or keeping an eye on the kids. The living area is two steps down from the foyer and boasts honey-colored wood floors and a large oatmeal colored area rug. 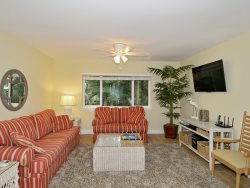 Beautifully furnished in the colors of the sea, a comfortable ocean blue couch, two club chairs covered in a coral pattern and a comfy solid beige chair invites you in for an evening of your favorite TV programs, or planning your vacation itinerary. Cream and wood coffee and end tables round out the room as well. The decorative fireplace with mantel and granite hearth is a focal point of the room and has a 46” flat screen TV mounted above it with a DVD player for family movie night! Built-in shelves flank the windows and add charm and interest to the room. 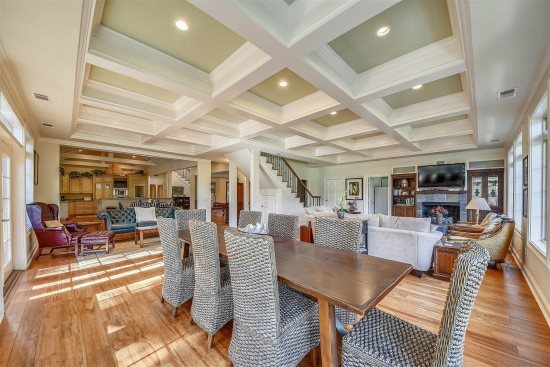 To the right of the entry foyer is the dining area which has a trestle style table and seating for eight. There is also a wine cooler for keeping your favorite wine chilled. Just off the dining area is the open and large gourmet kitchen with a table and four chairs and a large bench seat for the kids. Custom antique white and maple cabinets with bead board accents lend an air of style and sophistication to the kitchen décor along with stainless steel appliances, granite countertops, and a center island with wood top and an additional 2 bar stools; perfect for meal prep or just to hang out with the cook! Off the kitchen is a small sitting area, perfect for reading putting a puzzle together with access to and views of the pool. Just off the kitchen is the laundry room and access to the garage; the full-size washer and dryer means no dirty clothes to take home with you! There is also plenty of space for folding your laundry. The two-car garage is just a few steps down and is perfect for keeping your bikes and beach equipment as well as your vehicles. A gas grill is located on the side of the house, close to the outside shower and trash service area. This beautiful home has three bedrooms and two full baths. The master suite is large and offers a king bed and creamy off-white furniture with plenty of storage space. A sleep sofa is also in this room for extra sleeping capacity with two night tables. There is a 49” flat screen TV located on top of the chest of drawers, a dresser and two night tables with nautilus shell lamps. Access to the pool for a refreshing late-night dip would be the perfect soothing touch before a great nights’ sleep. The en-suite bath has a large jetted oval tub and shower combination, and rich double vanity. The middle bedroom has a beachy feel with twin beds, white headboards and furniture, and a 32” flat screen TV. This bedroom and the queen bedroom next to it, share a hall bath with large tiled walk-in shower and plenty of vanity space. The queen bedroom, which faces the front of the house, has white furniture which includes a dresser, headboard and two night tables. A white and taupe décor lends a fresh and soothing feel to the room. There are ceiling fans in every bedroom so you can sleep like a baby and keep cool and comfortable. Make this lovely home your vacation spot for years to come and memories to cherish. Please specify # of security gate passes needed at time of reservation; 1 pass per car $17/week. Sea Pines Plantation is Hilton Head Island's original and largest planned resort. While it is currently the home of the annual Heritage Golf Tournament, it is the abounding natural beauty that beckons one to return again and again. Five miles of white sandy beach offer swimming, sailing, parasailing, kayaking, and fishing. For the land lovers there are 14 miles of bike paths, 3 golf courses, tennis, and a broad range of shops and restaurants that will please every vacationer.